Where to start about Spirals in Nature? I mean there are so many! This is my love letter to Spirals in Nature. Read on if you want to find them and fall in love too. From seashells to lizard tails to delicate unfurling ferns and slices of veg, you won’t be disappointed. Below is a fairly comprehensive list of where to look to easily find naturally occurring spirals. I have also compiled more info on the maths in spirals or particularly on how Fibonacci numbers manifest in nature, and how to spot the interconnected spirals in a sunflower so be sure have a good look around the Smart Happy Project website. But, don’t let the maths and numbers put you off, what is important is to look and to be amazed by these spirals in nature, then your wonder will surely grow. 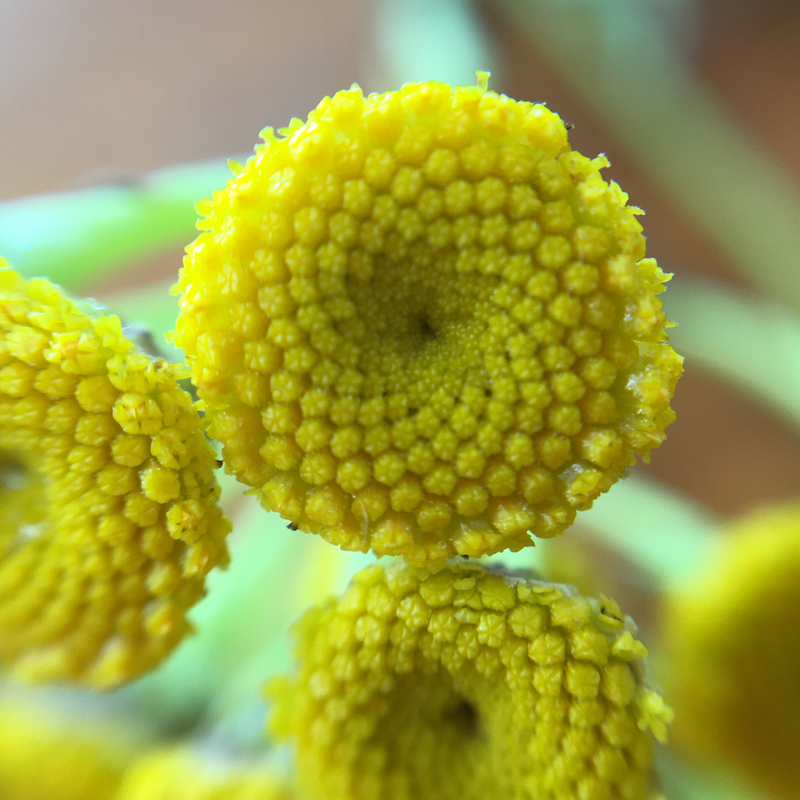 You will see how the patterns of spirals in nature indicate the mathematical rules of growth. Looking is the key to finding Spirals in Nature (no way Lisa, you’re not kidding?) I know, obvious, but you’d be surprised how little we see things sometimes. Improving observation skills is the first step to enjoying nature and building our relationship to it. The lists below will give you tips for where to look, but why look for shapes in nature? is also what the Smart Happy Project is about. Firstly a little distinction. Spirals in Nature occur in many forms, but for us to find them, it is helpful to think of just 2 concepts. Here you are looking for the flat curve spiral. 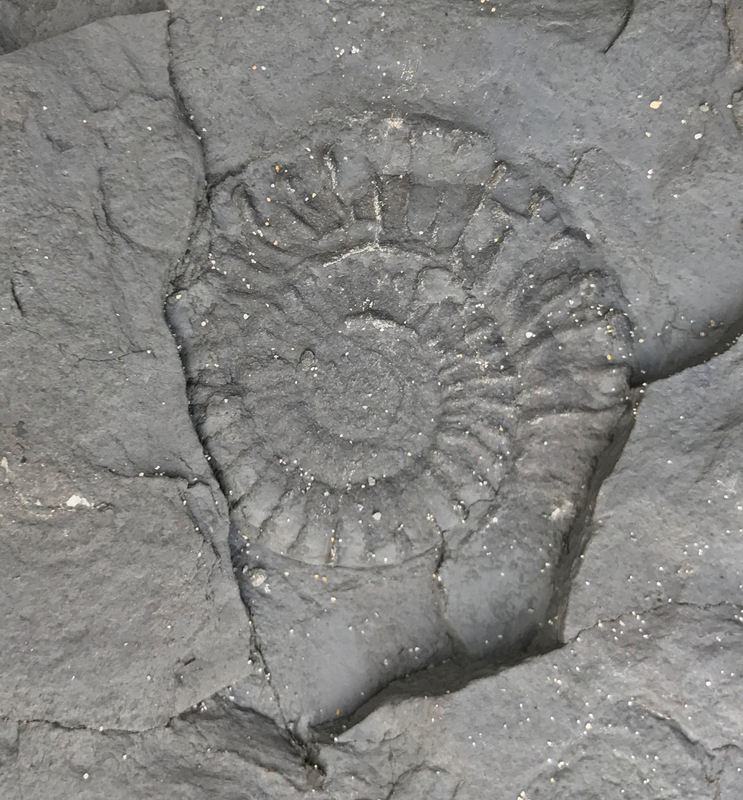 What the tourist industry along the UK’s Dorset coastline is built on – Fossils. 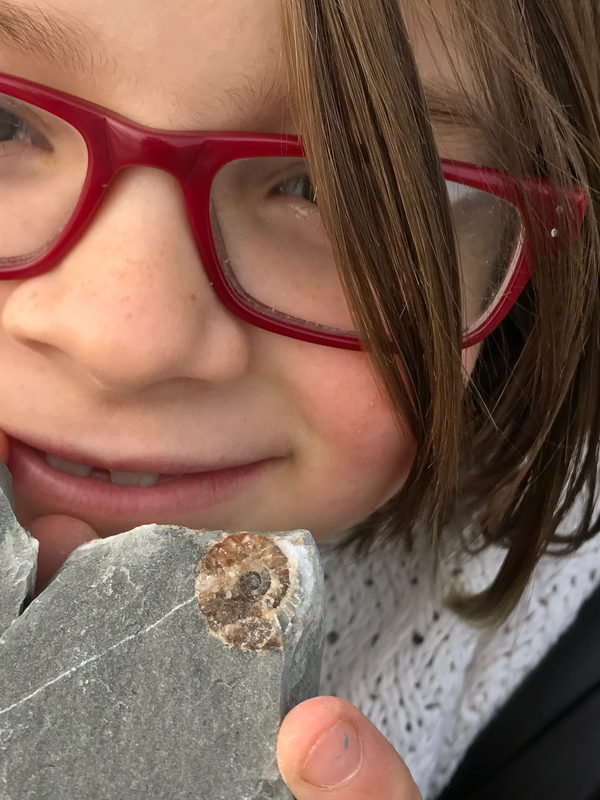 There are many fossil types but the Ammonite fossil is the spiral we are looking for and easily found along this stretch of this Jurassic coast in the UK both in calcite and pyrite forms its definitely worth a day trip. 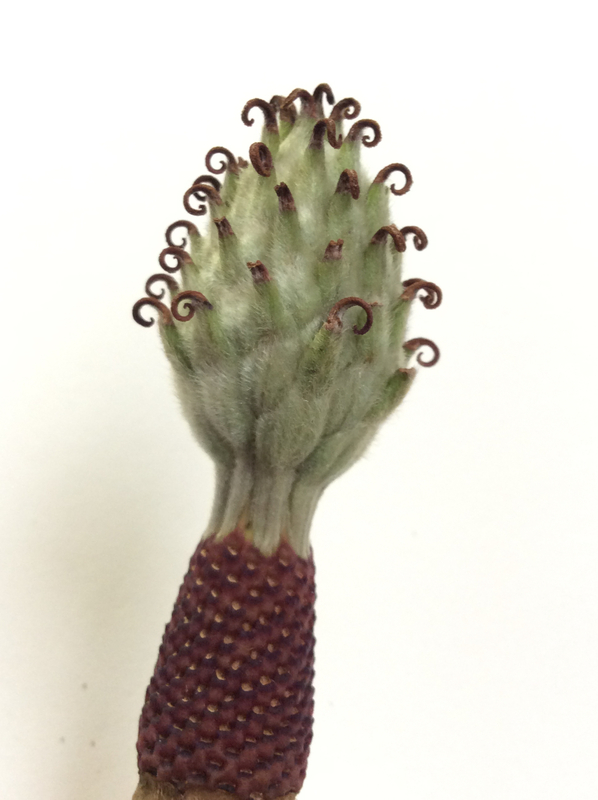 Plant forms have both types of spirals that we observe. 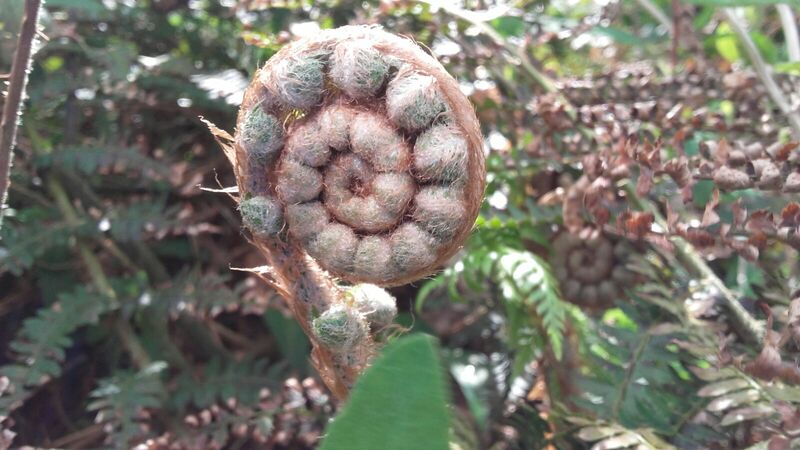 You can clearly see the spiral as a flat curve in ferns, but also as a 3D spiral in petals as they unfurl around the flower bud. There is nothing more glorious than seeing those young ferns unfurl in early spring. Often called a fiddle fern because of the resemblance to a violin scroll, there are so many fern types to see. These spirals in nature are the tendrils of pea plant. Although appearing to be an insignificant part of the plant, this is an example of a helix when in use. Flowers often display a spiral pattern. 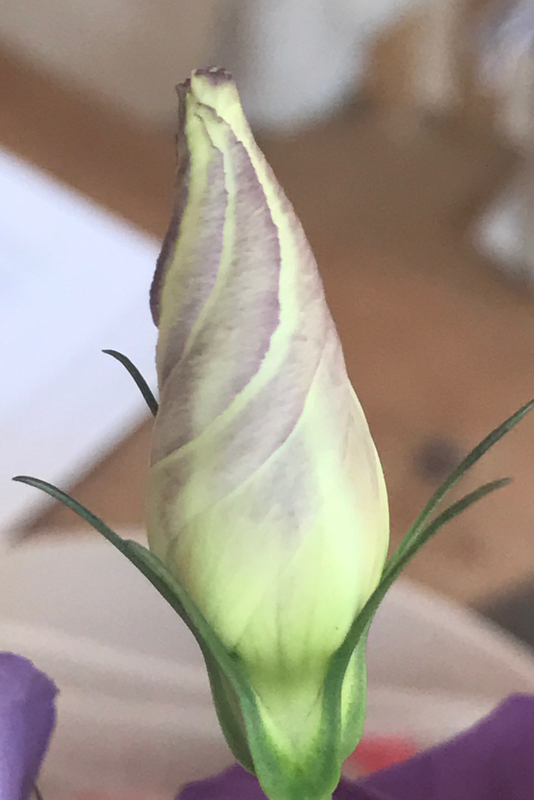 Also at the other end of the flower cycle the seed formation often clearly presents a multitude of interconnected spirals. 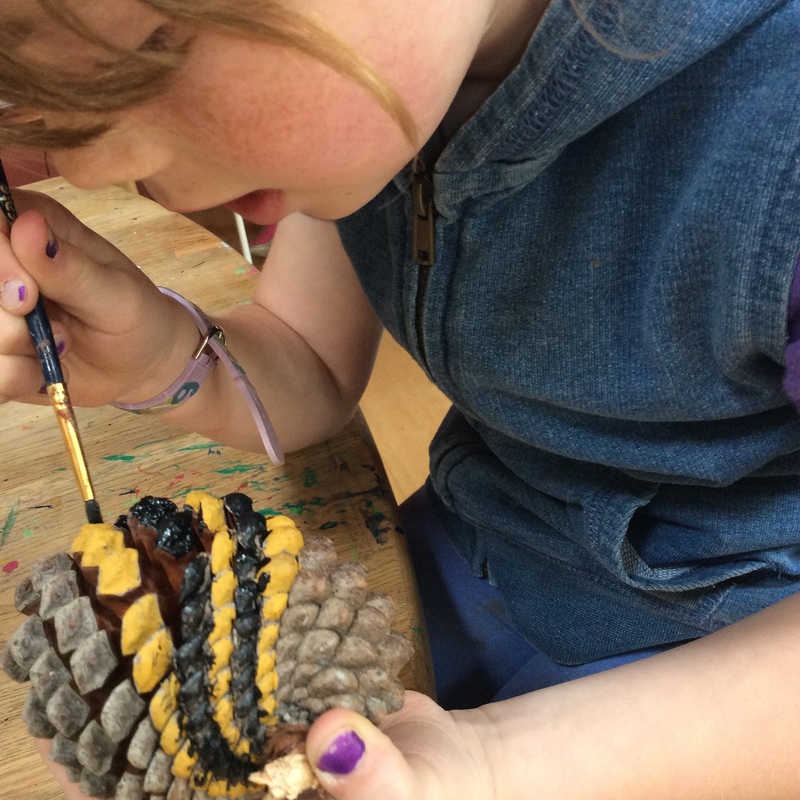 I often run a workshop with The Smart Happy club where we paint in the spiral onto the pine cones. Its a simple nature craft that encourages the observations skills and involves the hands and the eyes. 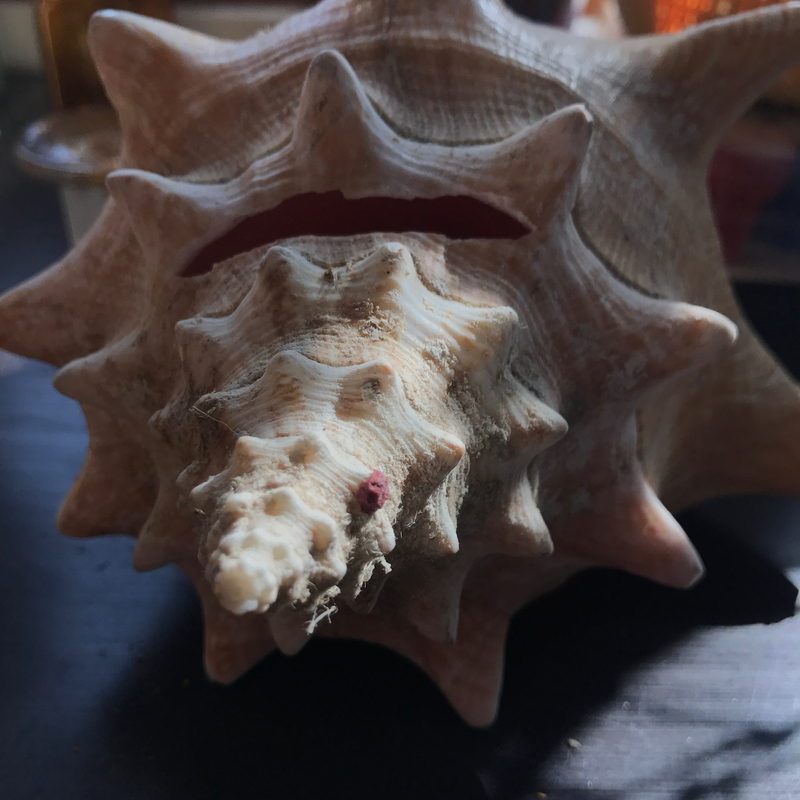 Seashells – I mean where to start? (just on UK is a good idea) Whelks and Periwinkles, Top shells, Limpets. There are so many variations to be found of just these types which you will see clearly how a spiral is the home of the mollusc that created it. Also look for the bivalve shells. Mussels, Clams, Wedge, Cockles to name just a few. Often you will only find one half which we call the shell. But you can see very easily how in this article the shape of shells is made and that actually the bivalve are also spirals. With some of these flatter bivalve shells the actual spiral is difficult to see because it is so distorted from what we expect a spiral to be. Yet spirals come in all forms, it takes just three factors to change the shape of a spiral. The video below gives you an idea of how all the different shells we see all conform to the same factors that determine their shape. Should you travel further afield than northern Europe the spirals in shells become more varied and elaborate. 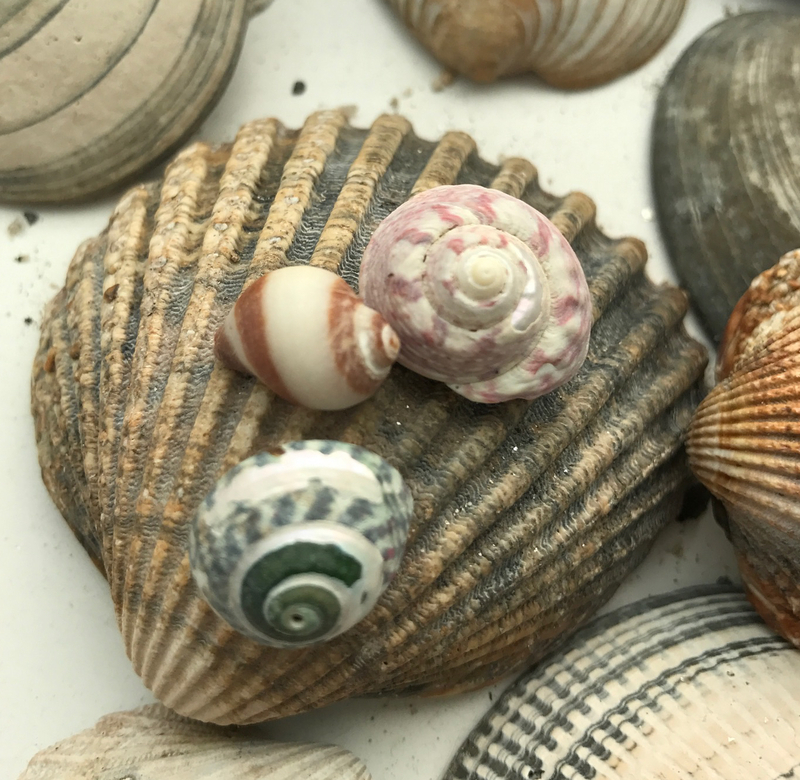 Yet all these shells will display the same principle of how there are grown by the mollusc and the 3 mathematical rules that determine the variations of the spiral. The Nautilus shell is the closest thing you will find that resembles what the creatures were that created the fossil we mentioned earlier. 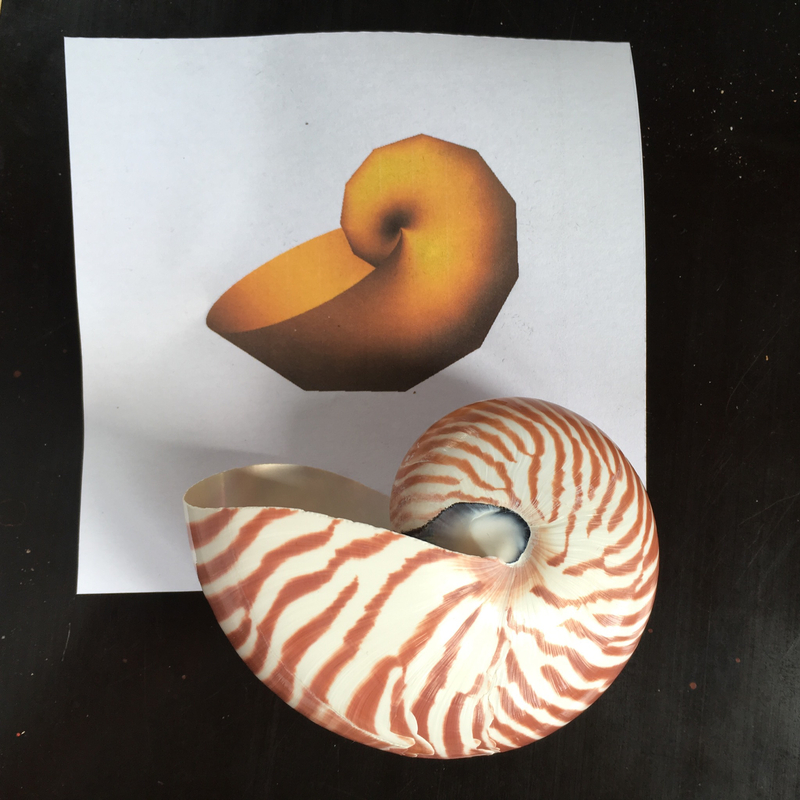 The Nautilus spiral is hailed as being a perfect Fibonacci spiral, reflecting the growth in the relationship between the sequence of numbers, sometimes also called a Golden Spiral. 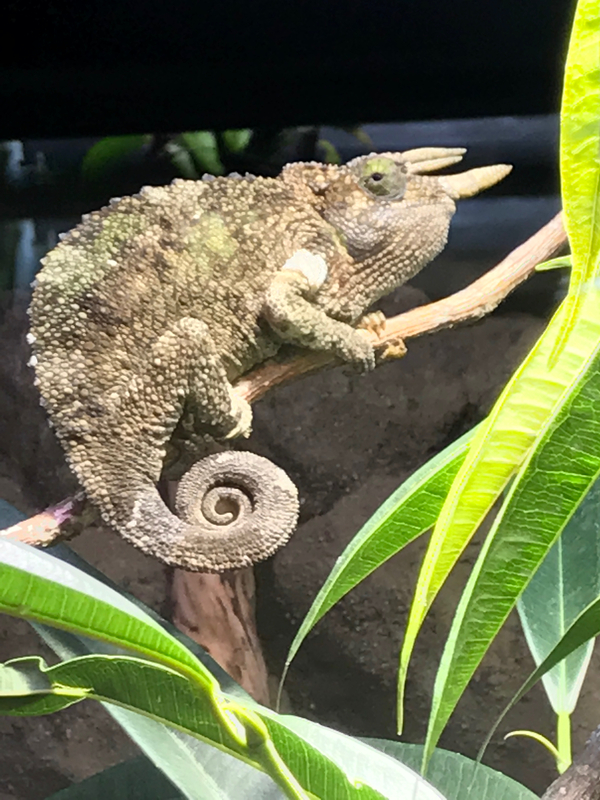 Thrilled to spot this spiral in the tale of the Jackson’s Chameleon. 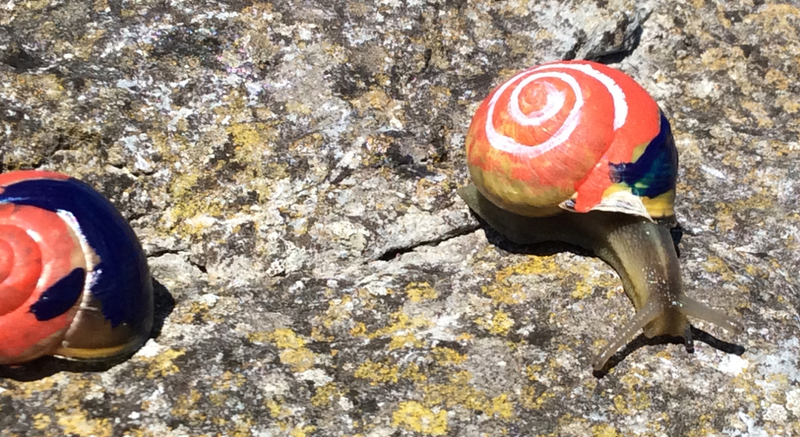 Snail shells come close to the molluscs of seashells. So many variations in pattern decoration. How thrilled was I to find this octopus washed up on the beach after a storm. 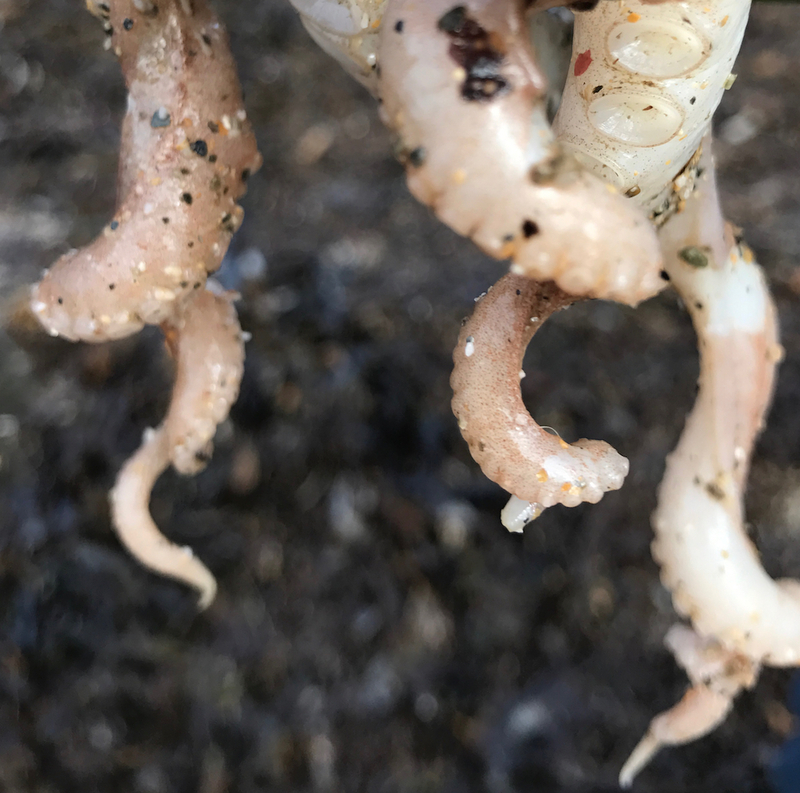 (sorry octopus) displaying for me perfectly his tentacles that fell in spirals. I would have associated the octopus with circles in nature because of his suckers, but now he is in my spiral collection too. 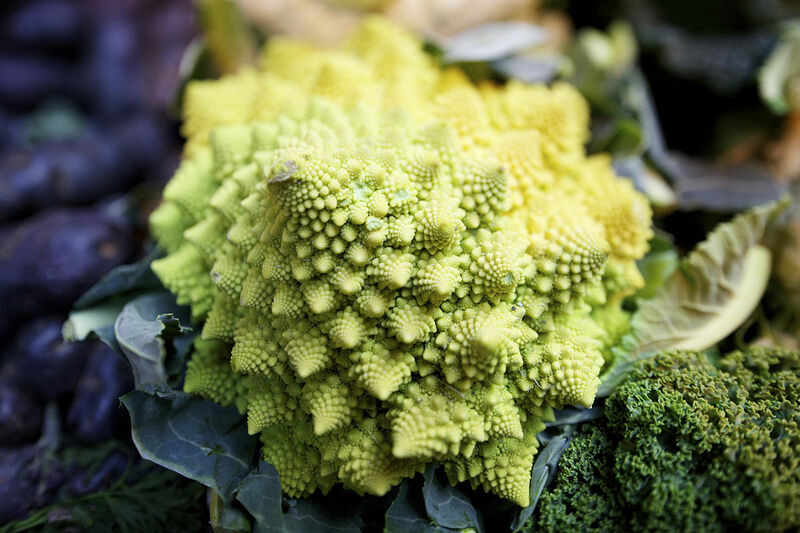 The Romanesco takes us on a journey into spiral fractals and if you slice a mushroom through the centre you can sometimes see a cross section of a curly spiral under the cup, sometimes referred to as the vortex. Of course the Cabbage display’s the spiral common in most growth forms of leaf and petal rotation which again comes back to the growing tips forming at most efficient angle. 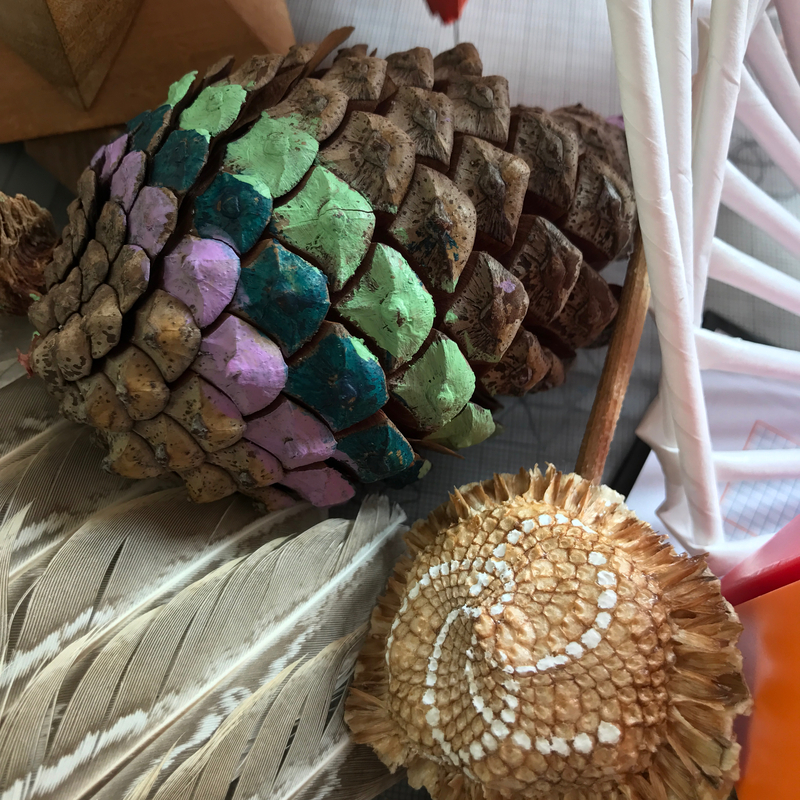 The Pineapple demonstrates the same pattern as the pinecone we painted. and the distribution of strawberry seeds will follow a similar pattern. Birds of prey are known to descend in a spiral movement as they home in on their prey, because of needing to always keep the prey in sight. There are spiral galaxies in outer space we still know so little about. Air flows in spirals around objects and water will form in a vortex spiral down your plug hole. Waves on the seashore are spirals that ever surfer knows how to read. 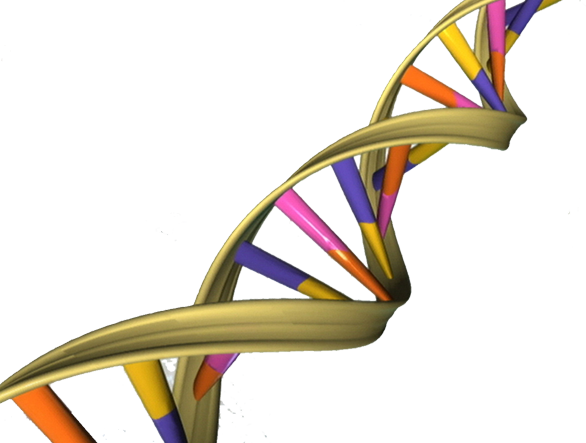 Although few of us ever see it, the inner ear is spiral shaped and the DNA cell structure is a double helix. But of course many of us have curly hair that falls in spiral ringlets and look carefully and you will see it spring from the crown of your head in a spiral direction. We touched on the 2 types of spirals i suggest looking for in nature, and we can also look at the geometry of different spirals and how they relate to measuring and form. There are Archimedean spirals, logarithmic or Fibonacci and we touched a little on the Golden spiral. 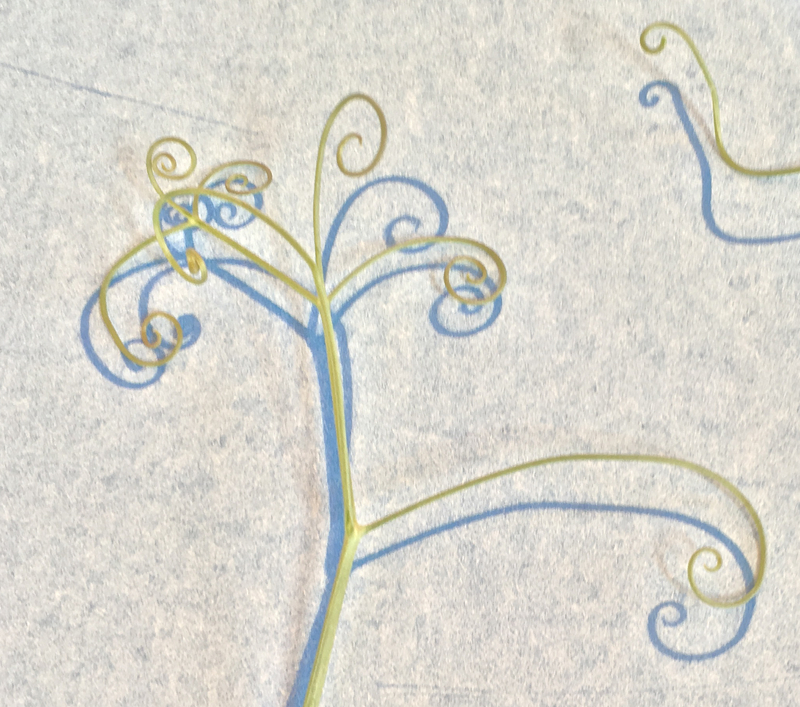 There are simple drawing exercises for students in a walorf inspired learning environment who can create spirals with simple tools and the Waldorf curriculum encourages the Advent spiral in its annual celebrations. But for now just get out there and look.